The much coveted (and extremely valuable) trophy can only be en tered if you have won a National Class Championship within that year. All classes sail the same dinghy – currently RS200’s over a weekend’s fleet racing in a series of very short upwind/downwind courses. 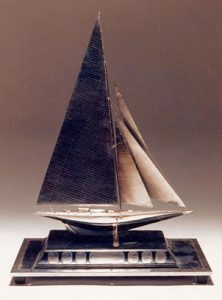 This year the RCYC have introduced a Keelboat version of the trophy. This will be sailed on September 22nd and 23rd using the 707 yacht. The RCYC have a fleet of these boats, all newly fitted out and ready to race. The type of racing is designed to make exciting, high speed sailing and minimise the spread in the fleet. With a target time of 15 minutes per race, the emphasis is on as many short races in as quick succession as possible. The winner of this event will be invited to compete in the main Endeavour Trophy event in mid October. Peter Thompson, this year’s Sandhopper National Champion, has put together a team and has entered the event on behalf of the Sandhopper Class and Thorpe Bay Yacht Club. His crew will be made up of: Mark Dell, Paul Beasley and Chris Clarke. All of whom are among our club’s top sailors. They will be competing against this year’s National Champions from the following classes: Squib, Sonata, RCOD, J24 and Flying Fifteen. All of these will be top class sailors and the racing, now with the addition of the Sandhopper Class, will be very exciting to watch from the banks of the Crouch. So, do come along and support them if you can.